In the era of the cyber world, getting news and information from online sources has become a habit for most of the people these days. Consequently, online magazines and newspapers are now an attractive field of business to invest to. There are several news sites in the market. They are big, powerful and got an enormous number of constant readers. It is hard to stand out of the crowd, especially in the crowd including prestigious names such as New York Times, Bloomberg, Mashable, Life Hack, and many other. But it is just “hard,” not “impossible.” Don’t you ever think about combining all the merits of these sites into your own one? 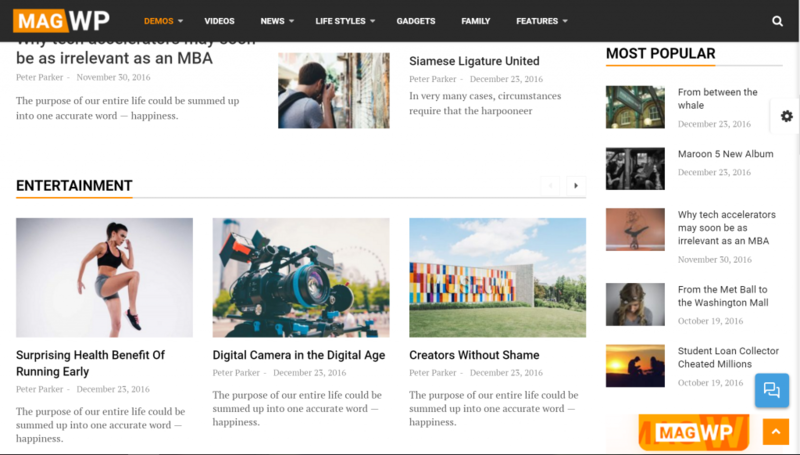 Let ThimPress give you a solution with the best Magazine WordPress Theme – MagWP. MagWP could be what you have been looking for so far because it suits any online newspaper, magazine, personal blog and so on. We apply the innovative technology from the world’s best online news site into one theme, to bring out the huge impression from your site to your visitors. With MagWP, you will have a website look like New York Times, Bloomberg, Pinterest or Lifehack. Yes, exactly the same! We can be proud to say that MagWP has redefined the interpretation of online publishing by improving performances of the site, coming up with a cleaner design and faster load speed. MagWP is equipped with a fantastic library of demos and layouts which are all carefully designed not only to impress visitors but also to maintain SEO data-structure. With 10 beautiful demos, 10 modern layouts and 3 different stylish types of articles layouts, you will have over 300 separated choices to wear for your sites based on your combination. Our massive library allows you to choose the style you want for your site. From the second version of prestigious magazines to different types of blog, they are all in our source. We designed MagWP to make sure that you can access to the latest technology while being super unique in the market. You will have the most advanced site but your visitors still have the best experience. If Bloomberg, Business Insider, etc are, obviously, attracting millions of readers every day, so does your page! Online readers are too familiar with well-known names. When they come to you, they will get a familiar experience with the UI but still a quite extraordinary adventure with the better UX, we bet. We provide you the materials, and the rest is all in your creativity. 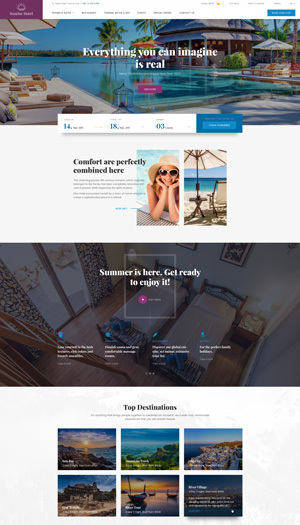 The theme aims to make you feel the most comfortable with your site, simply because it is yours; and you are the one have the power to control it from the very first look. MAGWP WAS BUILD WITH LATEST PUBLISHING TECHNOLOGY USED IN BLOOMBERG AND OTHERS. As mentioned above, MagWP is the first and the only theme that exerts the trendiest technology learning from the big famous online news site to get more readers and subscribers. But what is the technology? Thanks to machine learning and AI, MagWP can recommend more posts for readers based on their interest. It is smart. It knows what your readers used to read; then it can locate what their tendency in reading is. From that point, the suggested post section will display the articles which fit the reader the most. The recommendation like this helps to keep the visitors stay longer. Besides, the widgets integrated into MagWP are using the most advanced algorithm, which is able to find general visitor’s preference as well to show the better suggestion. New York Times and Mashable are doing the same methods with us. Come get it and try! Another feature making MagWP close to well-known sites is a Slide-in suggestion. When you are about to the end of an article, Slide-in, as its name, will “slide in” from your side to show you what’s more to read. This assistant gives suggestion related to the current content you are in. Slide-in is just a small reminder, appear at the right corner of the site. It can urge the reader to click, to explore more about what they are interested without clicking Back button to the home page and browse all the headlines again. It not only makes your site less boring as traditional pages are doing, but also leads your patrons to the best reading experience. Accordingly, more profits will come to the site owner. Slide-in has been proven to increase up to 30% of the time the visitors stay on the site. And the plus point for MagWP is that buyers don’t need any extra money to pay for this latest technology. Cool, huh? Have you ever spent hours on Bloomberg because they have so many things to read while you keep scrolling down the site? With MagWP, the visitors will have the same experience with your magazine or blog. After finishing one piece of news, besides the aforementioned suggested posts, visitors can just scroll down the page to read more news, mostly relevant to the previous post they have read. When they complete reading this one, another article comes. The news constantly appears, and it doesn’t let you stop reading, helps to cling the readers as long as possible. All you need to do is to prepare for yourself a robust and powerful team of content writers because what they write will be all on the page no matter how much it is. Are you ready for showing off? Sometimes the visitors pay attention to the tiny details that we, the creators, never notice. That’s why MagWP made the progress bar to attract visitors, give them an interesting impression while browsing for news. It is the bar at the top of the article, below the header menu. This bar lets the reader know how much they have read and how much is left. It helps them to control their time and their other business to decide whether they keep reading or set the article aside to read later. We believe this reading progress bar will fascinate the readers because only MagWP has this function. MAGWP IS EVEN MORE THAN YOUR EXPECTATION! Understanding the consumption of applications on mobile devices and the priority of Internet surfing on these gadgets, MagWP is a mobile-first design. We are using Google’s latest mobile standard – AMP to maximize the experience for all content types on any device. MagWP promises your blog posts, images or videos will look flawless and superb. In addition to this, the connection between the theme and other social networks helps to spread the news quicker and more straightforward. 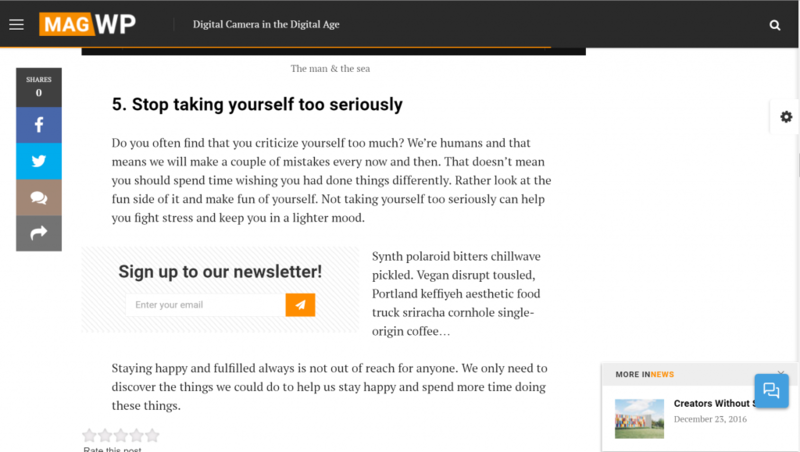 A social counter widget keeps following any scroll action and stays along the side of the article, which makes the blog shareable at anytime and anywhere, even in the middle of reading. Your news could be shared even broader and faster via sign up to newsletter form right in the article; thus, your patrons can get the news from their email, increasing the potential of accessing your page. Another unique feature of this theme is to turn your visitor into your writer by uploading their story. Your blog/newspaper will become more friendly and attract more viewers when they can share their own piece of writing to reach certain demographics. Reviews and ratings are integrated as well to gain trust from visitors. They can also find the high rating articles to read. A further function that helps to create an extraordinary MagWP is ThimCore – a very powerful tool developed by ThimPress. One-click installation is a marvelous function of ThimCore. You don’t need any particular techniques or extensive coding knowledge. ThimCore is here available to help. You will fully have the whole completed theme instead of wasting $50 for any installation service. Additionally, ThimCore plugin also automatically update to the newest version of the product to save time and money for you. This plugin is using Theme Customizer to let you adjust every section in your site according to your plan and wishes. Or you can also get to know better with our lovely new buddy. Just head right to our landing page here. 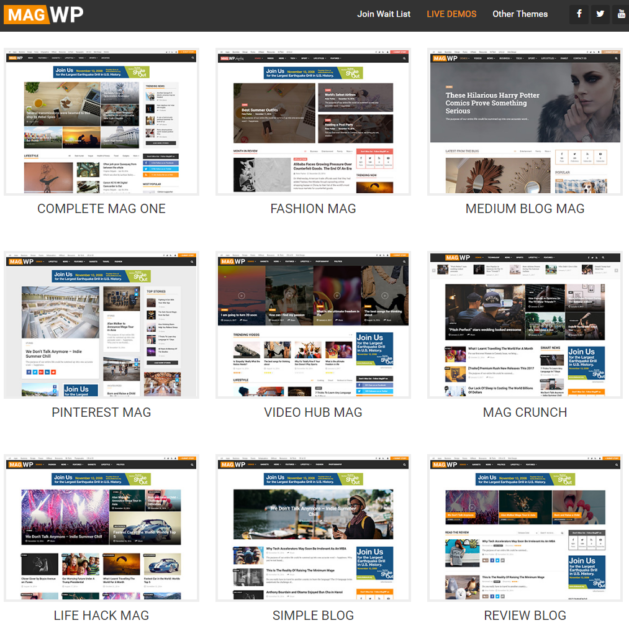 Do you find MagWP the most wanted theme for your newspaper or magazine yet? If what I have revealed from the beginning of this post cannot convince you yet, let the number do. This splendid theme is now offered only $39 for 100 early birds (usual price: $64)! Our customer service quality is going along with the quality of our every product. We are always ready to answer your question and support your problem. Why do you hesitate with this fantastic theme and wonderful supporters? Grab your chance right now and start to build your reputation with MagWP!